Locations: Ikh Gazriin Chuluu (Dundgobi) (45°29'33.24"N, 107°13'28.50"E) and National Mongolian Modern Art Gallery, Ulaanbataar, Mongolia. Participation in LAM 360º was funded through a Travel and Training Award in Visual Arts from The Arts Council, Ireland. 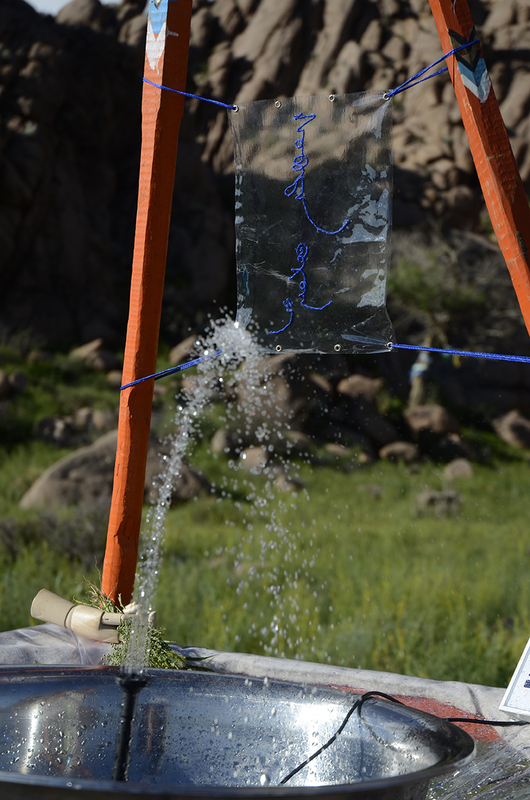 The project ‘Pearls of Rain’ takes as its starting point survival techniques of water gathering in arid landscapes. Using three systems of water collection the process based work attempted to ‘mine’ water from the desert environment. At a sacred site within the desert landscape I constructed a mobile structure that operated variously as a sculpture, as a site for discussion and exchange about the importance of water and as an object of redemption in the water stressed environment. Dew gathering failed in the dry atmosphere of the desert, rainwater harvesting was a slightly more successful collection system following some evening rain and seven solar stills yielded three litres of water. A solar powered fountain placed within the rainwater harvester mobile structure brought the sound of water to the desert environment. The solar stills were dug in the formation of the ‘Plough’ of the Ursa Major constellation, the largest constellation in the northern hemisphere. In conversation with a nomadic herder Batsuuri at his summer grazing location in Gurvansaikhan country I learned that his migratory route is defined by water and grass. 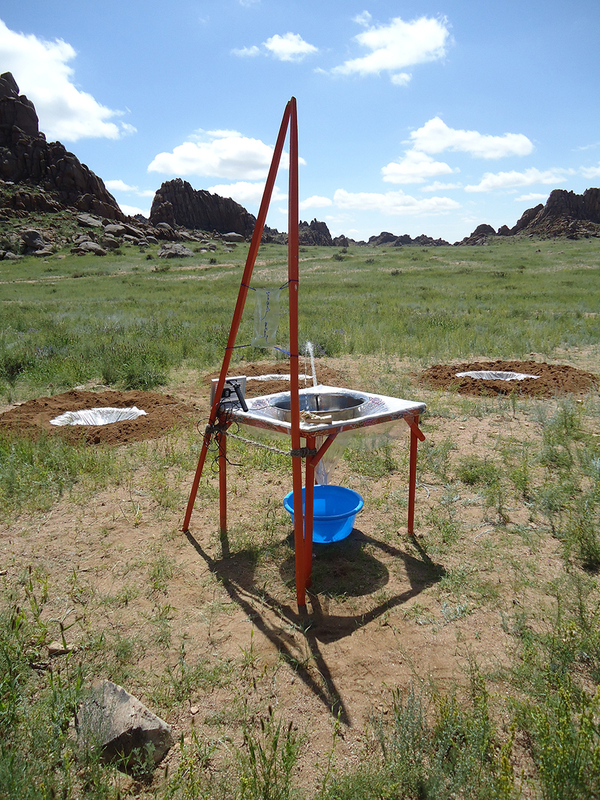 In recent years one local spring has disappeared as a result of mining activity in the region. Batsuuri thinks this way of life is too risky and he doesn’t want his children to continue the traditional nomadic lifestyle. Photos: Anna Macleod, Marne Lucas and Batzorig Chimeddorj.